RANE, known for his luminous and colorful oil paintings, married the classical with the contemporary. His timeless textured canvases are full of myths and glyphs and codices. His unique style encompasses goddesses and geese, pelicans and pomegranates, mythical animals and sea creatures. 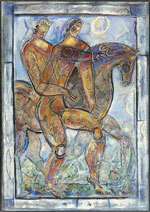 His range is broad - from the intuit of ancient cave paintings to the embrace of elaborate sea scrolls. The Hellenic female form appears in much of his work.